Cyprus is a republic with a presidential system of government. The 1960 constitution vests executive power in a president who is elected for five years. The president is elected directly by popular vote; voting is by universal suffrage and is compulsory.The president exercises executive power through the Council of Ministers and government spokesmen appointed by him. Originally, the executive was to comprise a Greek president, a Turkish vice-president and a council of ministers, with seven Greek and three Turkish members. Ministers did not have to be members of parliament. However, since 1963, the Turkish Cypriots have ceased to participate in government. Negotiations to create the basis for a new constitution to improve relations between Greek and Turkish Cypriots have been held intermittently since the mid-1960s. In 1975, Turkish Cypriots created their own constitution and governing bodies within the ‘Turkish Federated State of Cyprus’, though the only state which recognised the secession was Turkey. Since 1985, the legislature, the House of Representatives, was to be elected by universal adult suffrage with 56 Greek and 24 Turkish seats for a maximum of five years. In 1996 a system of proportional representation was introduced.The seats reserved for Turkish Cypriots have been unoccupied since 1963. The Republic of Cyprus became a member of the European Union in May 2004. The application of the aquis is suspended in those areas over which the Republic of Cyprus does not exercise effective control. Referendums on the UN reunification plan were held simultaneously in the two communities in April 2004 but the proposals were rejected. The judicial system is broadly based on English common law, and is presided over by the Supreme Court, which in 1964 succeeded the Supreme Constitutional Court and the High Court.The Supreme Court is the final court of appeal and rules on constitutional issues. The other organs of justice include the district courts, assize courts, family courts, rent control courts, the military court and the industrial dispute court. Greek Orthodox religious law also has an influence on Cyprus’s judicial system. The history of Cyprus can be traced to ancient times. The island was an ideal strategic base for the great civilisations of the Near-Eastern ancient world. Many of the ancient Greek myths, such as that of Aphrodite the goddess of love, make reference to Cyprus. 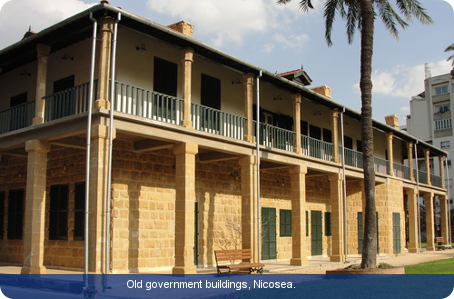 In 1878, Cyprus became part of the British Empire. From the 1930s, Greek Cypriots campaigned for union with Greece (enosis), a movement which by the 1950s had come under the leadership of Archbishop Makarios. In 1955 the National Organisation of Cypriot Fighters (EOKA) began armed resistance against the United Kingdom. Turkey helped the Turkish Cypriot leaders establish the Cyprus is Turkish Party and the Turkish Resistance Organisation, and the fighting became inter-communal. Having become independent from the United Kingdom in 1961, inter-communal fighting between Greek Cypriots and Turkish Cypriots soon broke out again. In 1974, after a military coup in Cyprus which overthrew Makarios and installed a government which strongly favoured enosis, Turkey invaded Cyprus. Turkey occupied the northern 36 per cent of the country, an area which was later declared independent. However, the only state which recognised the secession was Turkey. The leader of the Democratic Party (DIKO), Tassos Papadopoulos, won the presidential election in 2003, with the support of the Progressive Party of the Working People (AKEL) and the Movement for Social Democrats (EDEK). He defeated the incumbent president, Glafkos Clerides of the Democratic Rally (DISY). The parliamentary elections in 2006 were won by the governing coalition of AKEL, DIKO and EDEK. In the run-up to the presidential election of 2008, the governing coalition of AKEL, DIKO and EDEK were unable to agree on a common candidate, and AKEL thus left the coalition. The three major candidates in the elections were Papadopoulos (the incumbent, and leader of DIKO), Demetris Christofias (AKEL) and Ioannis Kasoulidis (DISY). Christofias won, and immediately invited DIKO and EDEK members to join his cabinet. After the 2011 parliamentary elections, AKEL and DIKO formed a coalition government. This came apart in August 2011 following policy disagreements, leaving AKEL in a minority government.